* Due to high demand, please allow 3-4 weeks for delivery. - Fits 1997-2001 Jeep XJ Cherokee 4-dr. Shown with optional mesh kit #90778. 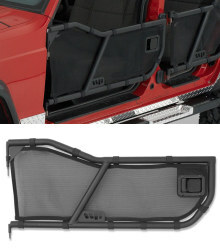 Warrior Products Safari Tube Doors. These doors are constructed from quality steel tubing and are jig built to ensure a quality fitment. Available for many models of Jeep, our doors are a great for maximizing visibility on the trails, and a great way to get out in the sun. Separately sold mesh covers are available that protect from road debris and offer some UV protection to your legs. All doors use a paddle style handle for quick latching and are quick and easy to put on. 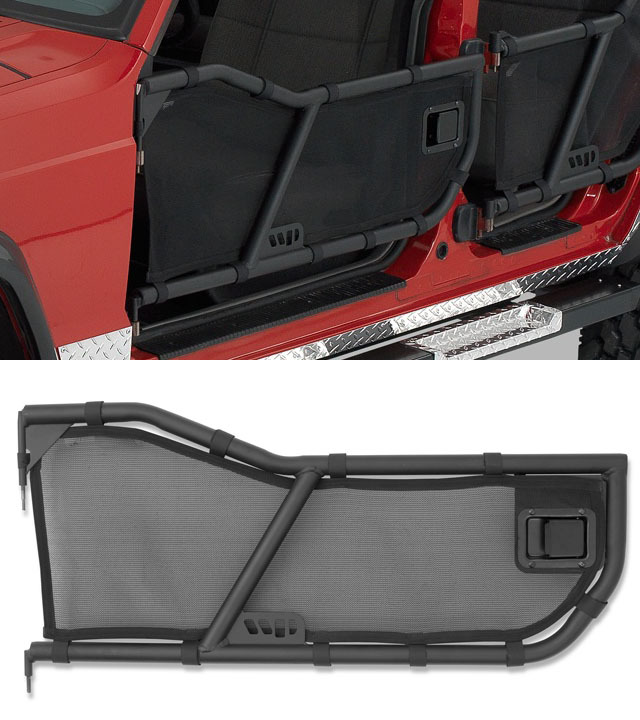 These tube doors are designed to replace the vehicle’s full or half doors, Tube Doors provide additional protection to front seat occupants while off roading. Tube Doors mount into existing door hinges and come with our deluxe paddle handle. Black powder-coated to provide a durable finish, these heavy-duty doors are ready for use. Notes: Tube doors and mesh covers are both sold in pairs. Mesh covers sold separately. Check your states laws before using your doors on highway. New Cherokee door requires hinge modifications.